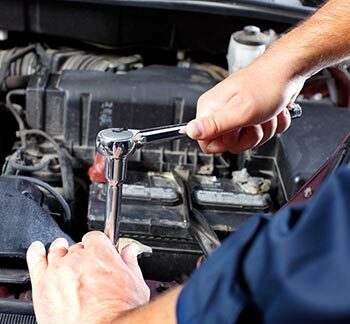 Since 1989, Road Runner Auto Repair has been providing reliable auto repair and maintenance services in Apple Valley, Victorville, Hesperia and surrounding areas. We are focused on our customers, and make sure that they are comfortable and confident with the services we provided. It is our mission to make our customers visits as convenient as possible. That’s why we are a one-stop-shop for all of your automotive, maintenance and tire buying needs! Our skilled ASE Certified technicians utilize state-of-the-art technology to handle auto repairs on all makes and models. 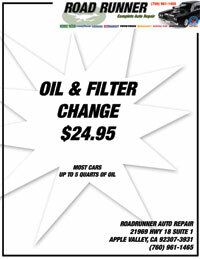 We encourage you to come see us and let us help you keep your vehicle running smoothly. Road Runner Auto Repair is family owned and operated, se habla español.